SAN DIEGO - The aunt of a 1-year-old girl rescued at sea by the U.S. Navy says the baby's fever is gone, and she is responding well to medication after showing salmonella-like symptoms before her family's sailboat broke down. Sariah English told The Associated Press on Monday that her niece, Lyra Kaufman, was checked by military medical personnel after being boarded onto the USS Vandegrift on Sunday morning but her illness has not been diagnosed by a physician, yet. English said her sister, Charlotte Kaufman, called her from the warship and told her that Lyra was bouncing back with new medication. The girl had salmonella before they left on their trip but was thought to have recovered. 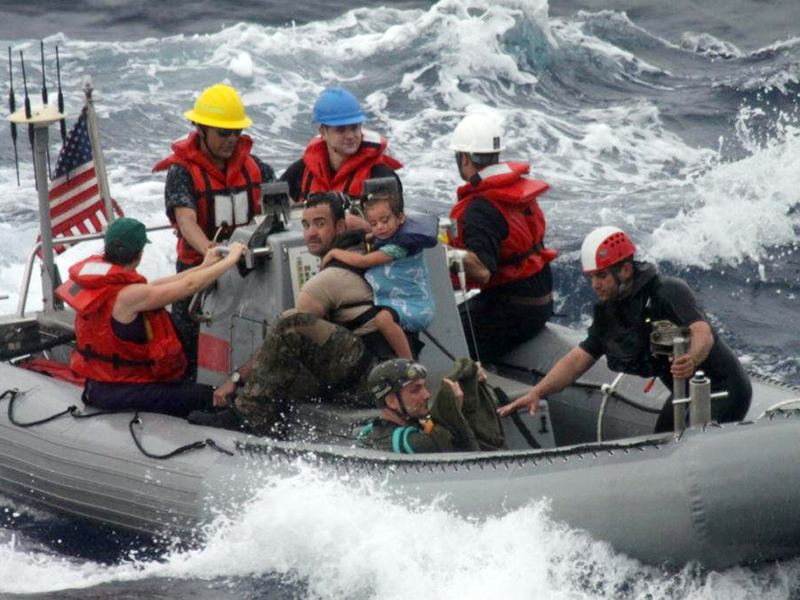 The Kaufmans and their two children were rescued 900 miles southwest of Cabo San Lucas, Mexico. The Navy warship carrying Lyra is expected to arrive midweek in San Diego. The USS Vandegrift was moving at 20 knots or about 23 mph, though the speeds will vary, and officials do not have an exact day yet of when the Kaufmans will arrive, where their baby is expected to get further treatment, Navy spokeswoman Lt. Lenaya Rotklein said. About 200 sailors were also on board the ship. The child fell ill during the family's voyage to sail around the world in their 36-foot boat, Rebel Heart. When their boat lost steering and communication abilities 900 miles southwest of Cabo San Lucas, Mexico, the family sent a satellite call for help to the U.S. Coast Guard on Thursday. The Kaufmans, their 1-year-old daughter, Lyra, and her 3-year-old sister, Cora, started across the Pacific in March. After they set sail, the baby girl developed a fever and a rash covering most of her body and didn't respond to medications. A statement from the parents, Charlotte and Eric Kaufman, a Coast Guard-licensed captain, said their daughter, Lyra, was doing better on the Vandergrift. Authorities have declined to identify the girl's illness, citing privacy laws. Before the family left for the trip, Lyra had salmonella poisoning, but doctors cleared her to travel after she was healthy again, Charlotte Kaufman's sister, Sariah Kay English, said. Four California Air National Guard members parachuted into the water and reached the boat Thursday night. The crew stabilized the girl, stayed by her side and then hopped on an inflatable boat with the family to board the USS Vandegrift on Sunday morning. Authorities decided to sink the Rebel Heart because it was taking on water. The family took only what they could carry from the broken boat - three bags - and they were disappointed to lose the sailboat they called home. "We understand there are those who question our decision to sail with our family, but please know that this is how our family has lived for seven years, and when we departed on this journey more than a year ago, we were then and remain today confident that we prepared as well as any sailing crew could," the San Diego couple said in a statement from the USS Vandegrift. "The ocean is one of the greatest forces of nature, and it always has the potential to overcome those who live on or near it. We are proud of our choices and our preparation," the statement said.